This Yishun HDB flat features a bit of Scandinavian, a bit of eclectic, a bit of Victorian—and a whole lot of fun. Danny Chan and Valene Lin, who have been married for two years, easily fall under the category of "happy couple." They radiate a welcoming warmth and love to laugh, and this exuberance is clearly evident in the home they're living in. "Our home speaks of us. When our friends would come over, they were like, 'it’s very both of you.' We’re very bubbly," says Valene, who is a blogger. "This is our personality," adds Danny, who works as a banker. He emphasises his point: "I wear green or blue pants to work. My colleagues will say, 'You work in a bank.' But for me, I just wear different pairs of pants to reflect my moods. Black can get so boring." It's no surprise that their home is alive with colours and playful decor. While their 5-room flat in Yishun is predominantly painted in off-white—with a vinyl flooring that has a wood-feel—it's infused with bright hues and quirky details that give the home a fun personality. "It's eclectic with a little bit of retro here and there," says Danny. "I really can’t say a specific style for my house. Our bedroom is a little Victorian and the kitchen is contemporary," adds Valene. The key to the HDB interior design process—they decorated the house themselves with an interior designer executing their plan—was knowing what they needed beforehand: a chandelier in the bedroom, Tiffany Blue paint by the dining area, a brick wall. They fit these requirements in their flat and topped them up with stylish and functional add-ons to create a home that is after their own heart. One of Valene's requirements pre-renovation was a shoe cabinet for her growing collection of shoes. They would also need a shelf to house their trinkets. "I have my own figurines. He has his own figurines, so we wanted open shelving. A glass cabinet would not go with our design, because it’s going to be too modern," says Valene. The couple dressed up the shoe cabinet and shelf with decorative knick-knacks. 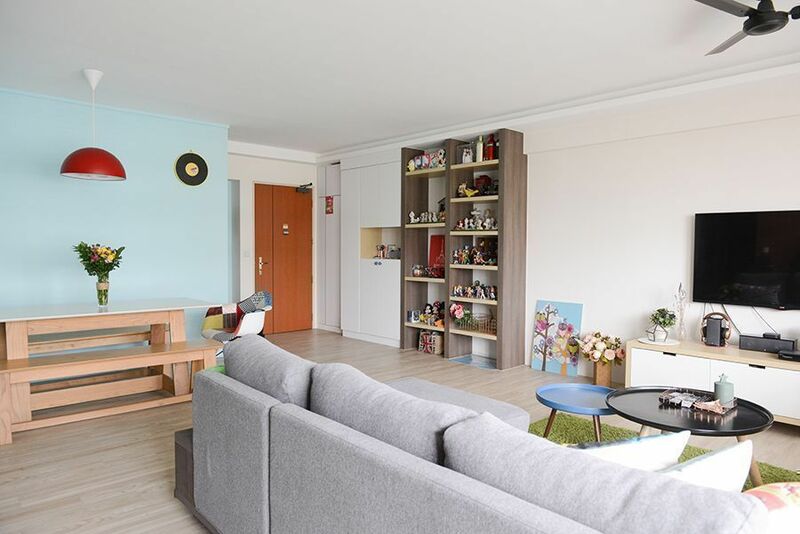 This flat was built to grant the couple's wish of a spacious living room: it's big enough to accommodate Valene's piano with plenty of room to spare. One of the most eye-catching pieces in the living room is this yellow armchair decked with an inspirational typography pillow and colourful plush toys. "We got it from a store that already closed. We wanted to buy the chair but we didn't know how it would look like because the house wasn't finished yet. But when they had the closing down sale, we just got it," Valene says. Valene admits that she loves decorating the house, and this includes changing the cushion covers regularly. "We can’t change the sofa but we can change the cushion covers," she says. The sofa was sourced from Cellini. The artificial grass rug and the mustard yellow armchair bring the living room to life. The tables are from homestolife. Corners and surfaces are brightened up by small toys and knick knacks. "Little things make a lot of difference," says Danny. Originally, the couple wanted a white brick wall, but the store ran out of white bricks and only had the regular red orange ones. They thought about just painting white over the red brick wall, but when they saw the results, they decided to skip the white paint and retain the look. "We saw the red brick wall, it was like a blessing in disguise. It looked nice. Meticulously tiled, not lopsided-looking. They put it brick by brick. They tiled that one by one," says Danny. This owl painting from Ikea is placed on the floor right beside the shelf that holds the couple's collection and travel souvenirs. "Some of the things on the shelf were things we saw along the roads," Valene says. Props from Valene and Danny's wedding now serve as decors in the living room. "I love the dining area. It's cosy and simple. It has a very Ikea—Scandinavian—feel. This is where we gather friends and family. Each bench can sit four people. All in all, this place can sit 12. It's a fun area," says Valene, who loves playing host to family and friends. The couple believes in the power of flowers to revive any room. "Flowers make a lot of difference. When I remove this vase, this table becomes plain. They do brighten up the place," says Valene. The Tiffany Blue paint also lifts the look of this area. The quartz top table ("solid stone, sturdy, and very low maintenance") was also sourced from Cellini. The Eames-style printed dining armchair is from Comfort Design. Valene, who loves baking, opted to have the galley kitchen done in contemporary style. One of the bedrooms in the flat was transformed into the couple's study and home office. It's furnished with yellow and Tiffany Blue chairs from Taobao. The couple's flat is populated by Valene's DIY creations, including this calligraphy poster. "I'm learning brush calligraphy. I'm learning how to write in a better way," she says. The couple used the bomb shelter door as a display platform for their Polaroids and graphic postcards. French outdoor post lamps light up the hallway, and serve as visual cues to bring the couple from the eclectic look of the living room to the Victorian feel of the bedroom. Valene explains, "You have to know how to transit your way from a colourful room to a very plain white room. Our bedroom is just plain white with a bit of black." The master bedroom takes on a neutral-toned stance: beige-framed white headboard, grey pinstriped bed spread, white paint, and white wardrobe. As the couple wanted a touch of Victorian in this room, they had an ornate beaded chandelier installed, and added brass knobs to the wardrobe for the luxury feel. Even the headboard is designed to exude a modern Victorian feel. Like in the living room, cove lights are also present in the bedroom to make it more cosy especially at night. The couple's bathroom assumes a contemporary and sleek look. For Danny, one of the most complicated decisions they had to make in the house was the choice of flooring. "We had to compromise. One of us wanted dark, the other light. So this vinyl flooring was a good compromise. Once the floor was decided, everything about the renovation started flowing smoothly." What do Valene and Danny like most about their house? Valene says she's in love with the colours injected into their household. Danny says it's the character of the flat that truly pleases him: "Most importantly, this house really represents us. We are colourful persons. There’s always laughter in the house. It’s very cosy in this house. It gives off the feel that we want. It brings laughter and happiness and warmth." 1. Figure out your needs and wants. "You and your partner have to know what you both want, and compromise (if needed). Know your needs: When you have lots of shoes and clothes, you need carpentry. If you cook a lot, you need to focus on the kitchen," Valene says. "Sometimes when a designer enumerates the things you need for the renovation, three out of those 10 things you don’t really need. It's important to know your needs and what you don’t want." 2. Mind the floor. "Flooring plays a big part. Focus on getting the right material for flooring," says Danny. 3. Research and gather ideas. "Speak to more than four IDs, and by then, you will know what you want. Gather more ideas to make you more focused and decisive. You can also go to Pinterest for ideas—some of these ideas may not be applicable to HDBs, but you can always adjust." 4. Change decor regularly. "In order to not lose your liking for the house, change things here and there. Little things make a lot of difference. It’s not how sophisticated-looking the carpentry must be—it’s the little things you decorate that will make the carpentry stand out. Don’t belittle a plain Jane—when you dress it up it’s no longer a plain Jane. And try to have yellow stuff…it brightens things up."